It is commonly said that childhood is the best period of one’s life. It is as least a beautiful time, magic and unique. It is the period of innocence, of incredible (often imaginary) adventures, and of the craziest dreams. Children are the most beautiful creatures on earth and I believe that each parent would do everything to protect their offspring. If children are a real source of joy and pride, they are nonetheless extremely fragile and vulnerable when facing the rough reality of our world. While most of children of the Western world are spoilt (and hyper spoilt in some cases), we tend to forget about the unluckiest ones, those children and adolescents living in areas of armed conflict in other parts of the globe. For the period 1986-1996, it has been estimated that 2 million children have been killed, 4–5 million have been disabled and 12 million have been uprooted from their homes (United Nations Children’s Fund 1996). Since data have not been updated, on the grounds that an attempt to aggregate numbers would give inaccurate results (Machel Study 10-year strategic review: children and conflict in a changing world. United Nations Children’s Fund 2009). However, according to 2006 estimates, more than 1 billion children under the age of 18 were living in areas in conflict or emerging from war. Of these, more than 18 million children were refugees or internally displaced. In the Middle East, specifically Israel, Palestine, Lebanon and Iraq, children are daily exposed to extreme violence. In Palestine, 23–49% children witnessed a friend being killed, 51–71% witnessed bombardment by airplanes and helicopters, 75% witnessed people killed by rockets, 37% saw family members arrested and humiliated. 4 to 7% had been shot. 99% had their homes shelled, 8% demolished . In addition to this extreme violence exposure, Palestinian children are living in poor conditions that worsen from year to year [1, 2]. Conditions of poverty, owing to the border blockade, the destruction of infrastructure facilities during conflict and ongoing socio-economic decline, make the civil population feel increasingly insecure and under threat. A large proportion of the population lives in poverty within camps that seem to be ever more exposed to violence and military incursions, clashes between internal factions and indiscriminate demolitions of private dwellings; in addition, a chronic lack of infrastructure (Palestinian territories have very basic schools and hospitals) makes daily life extremely difficult and uncertain. Moreover, in the West Bank the Israeli Defence Force patrols the area that triggers altercations with civilians. The presence of Israeli settlements also restricts the movement of Palestinians and results in intermittent small-scale violence. Conditions are typically tougher still in Gaza, where the 2008 blockade has increased unemployment and caused a shortage of basic goods. It is then not a surprise that most of Palestinian children are subject to traumatic conflict-related exposure that correlates positively with prevalence of mental, behavioural and emotional problems. A review of literature by Domitri L.  reveals that in Palestine, post-traumatic stress disorder (PTSD) prevalence is estimated to be 23–70%. As many as 25–35% of children have at least mild depression, 40–100% present high anxiety levels, 14% conduct disorder, and 28% of Palestinian children feared leaving the house. I would not dare to say that children in Israel are luckier, as they are also subject to mental health disorders: prevalence of PTSD in children is estimated to be 5–8% in Israel. It is however important to understand the differences in situation between the countries. Israel is a relatively stable country and has been able for the most part to preserve its infrastructure. The government, health and educational services remained fully functional. Thus, in Israel people are able to maintain a routine and normal lifestyle in times of relative peace. On the other hand, Palestine is exposed to similar armed conflict but the higher intensity and the lower socio-economic status are correlated with higher rate of mental health symptoms and PTSD, posttraumatic reactions and aggressive behaviours as consequences of political and military violence. If there is a positive side to this story, it is that despite the inhuman living conditions and extreme daily violence to which these children are exposed, they appear to display positive adjustment to traumatic events, relatively high levels of optimism, life satisfaction and resilience in the face of adversity”. These adaptive qualities have been examined in an interesting study by Veronese G. et al. , comparing subgroups of Palestinian Arab children living in different contexts: either in the West Bank, residents of urban districts (Tulkarem), refugee camps (Nur Shams) and rural villages (Assalam and Shufia); or residents of Israel (Nazareth). Surprisingly, the children in the refugee camp (despite highly negative socio-economic and sanitary conditions) are more optimistic – along with children from the rural villages (less exposed to military violence, but highly prone to ill health, malnutrition and the consequences of poverty in general) – than the children in the other subgroups and had the highest scores of all the subgroups for perceived subjective happiness. On the other hand, the Tulkarem children – who come from a city devastated by continuous military incursions, curfews, night-time house-to-house searches, imprisonment and targeted murders – rate themselves as less satisfied than the other groups of children. Interestingly, the functioning and well-being of Palestinian children are generally very high and do not differ from that of Israeli Arab children living in the city of Nazareth. The hypothesis that is put forward by the authors to explain the results of the study is that “positive functioning in contexts of political and military violence will be promoted if, in the face of adversity, the child is able to remain optimistic and satisfied with itself and its cultural group. Thus, the more the context is able to attribute meaning to adversity and to actively involve children in the struggle to overcome it, the more individual well-being will be protected and the traumatic and posttraumatic effects of war reduced.” In other words, the social context enabled children to make sense of their suffering. This seems to support study by Elbedour et al. 1998, that showed adolescents who perceived the world as unjust and politically unresponsive, incomprehensible or unpredictable to be more likely subject to psychopathology. Indeed, children in Nur Shams seem to identify very deeply with the symbolic meanings relating to their status as ‘offspring’ of the refugee camp: hope for the future of Palestine, redemption of their humiliated and exiled fathers, symbol of resistance against the ‘enemy Israeli’. They construct their identity as ‘resistant’ in the context of the camp itself, and the want, poverty and fear which they are obliged to face do not diminish their satisfaction and pride in taking active part in the life of the camp and in ‘combat’. Maintaining a degree of continuity in their personal lives, and building up a routine, allows youths to regain a sense of stability. In contrast, the Palestinian Arab children living in Israel seem to be frailer in terms of identity, perceiving themselves as half-way between Palestinian ‘internal refugees’ in a hostile country, and second-class Israeli citizens. Children are shining jewels, models of courage in the face of adversity and of their oppressors. At times of intense conflict, they are especially extremely vulnerable. Ensuring children’s basic needs including love, food, shelter and health care is paramount in protecting them from mental health problems . 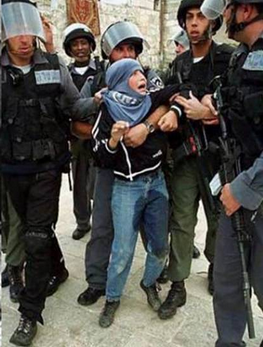 For stealing innocence of these children _ for that and for the long series of international laws that it violates  _ the criminal “State” of Israel and anyone supporting it should be heavily sanctioned. Dimitry L. A systematic review on the mental health of children and adolescents in areas of armed conflict in the Middle East. Child Care Health Dev. 2012 Mar;38(2):153-61.